Val D’Isere condos for sale are located on French Street just north of the historic district in downtown Breckenridge. They sit on a slight rise, just a block east of Main Street, which puts them within a couple of blocks, at most, from City Market, the gondola and the bike path. This path run to the south end of town and north to Frisco, where it connects with other paths around the county. Main Street has sidewalk and a bike lane, so everything in town is walkable from Val d’Isere. Check out the Val D'Isere condominium listings below, or read more about this popular condo community. Val D’Isere condos are small, around 500 square feet, and just one-bedroom. This is a plus, if you’re not into housecleaning, and just want to get out to ski. The building has off-street parking, a common laundry and barbeque area, and the homeowners association takes care of all the common chores. Any Val d’Isere condos for sale are offered to the other homeowners, who have first right of refusal. Rental income – either short or long-term – is highly likely from these efficient units. And their location makes them ideal to rent to locals or tourists who don’t want to rent or own a car. Size (sq. ft. liv. area) : 442 to 504 sq. ft. Amenities: in town, on free town bus, near the gondola, grocery, surface off-street parking. From the traffic circle on the north end of Breckenridge, exit into Main Street and continue south one block to French Street. Turn left and then right to remain on French. There is a busy alleyway before French but it is the first street. Val d’Isere will be a block up on the right, turn right into the parking lot. 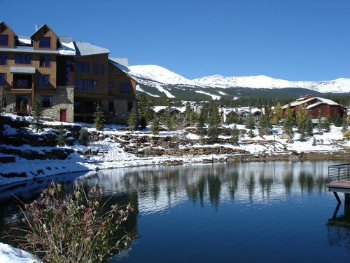 Get in touch with us for all of your Breckenridge real estate needs! You can send us a message now, or phone us at (970) 453-2200.